Desert Punk is a Japanese action, comedy and sci-fi TV series set after a nuclear apocalypse has hit Earth and modern Japan has been reduced to rubble and dust. In it, a mercenary antihero nicknamed Desert Punk has to overcome obstacles during his travels, while stumbling upon both friends and foes who want nothing more than trouble. First four episodes of the action comedy anime series set in a post-apocalyptic Japan, which has been reduced to a desert where the few surviving humans eke out their living in the hot sand. Against this stark background, mammary-obsessed mercenary Kanta Mizuno, aka 'Desert Punk' ('Sunabozu'), carries out his less-than-noble assignments. 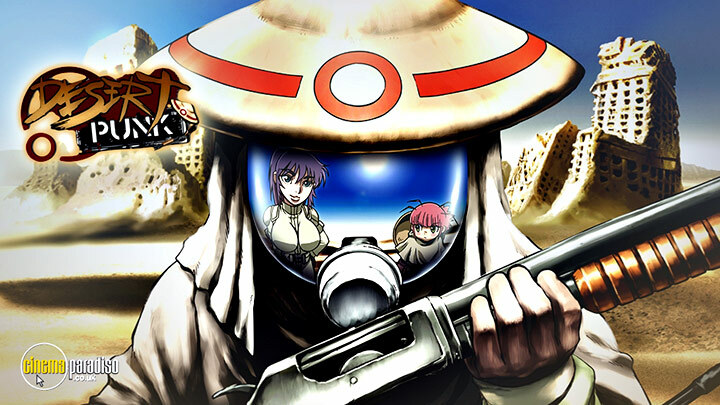 Episodes 5-8 of the action comedy anime series set in a post-apocalyptic Japan, which has been reduced to a desert where the few surviving humans eke out their living in the hot sand. Against this stark background, mammary-obsessed mercenary Kanta Mizuno, aka 'Desert Punk' ('Sunabozu'), carries out his less-than-noble assignments. Episodes 9-12 of the action comedy anime series set in a post-apocalyptic Japan which has been reduced to a desert, where the few surviving humans eke out their living in the hot sand. Against this stark background, mammary-obsessed mercenary Kanta Mizuno, aka 'Desert Punk' ('Sunabozu'), carries out his less-than-noble assignments. Episodes 13-16 of the action comedy anime series set in a post-apocalyptic Japan which has been reduced to a desert, where the few surviving humans eke out their living in the hot sand. Against this stark background, mammary-obsessed mercenary Kanta Mizuno, aka 'Desert Punk' ('Sunabozu'), carries out his less-than-noble assignments. Episodes 17-20 of the action comedy anime series set in a post-apocalyptic Japan which has been reduced to a desert, where the few surviving humans eke out their living in the hot sand. Against this stark background, mammary-obsessed mercenary Kanta Mizuno, aka 'Desert Punk' ('Sunabozu'), carries out his less-than-noble assignments. Episodes 21-24 of the action comedy anime series set in a post-apocalyptic Japan which has been reduced to a desert, where the few surviving humans eke out their living in the hot sand. Against this stark background, mammary-obsessed mercenary Kanta Mizuno, aka 'Desert Punk' ('Sunabozu'), carries out his less-than-noble assignments.